African Rock Hotel Johannesburg South Africa is an exclusive boutique hotel located a mere 11 km from the Johannesburg International Airport, O.R. Tambo in the quiet suburb of Kempton Park. The hotel is ideally positioned for conferences away from the flight path of arriving and departing planes. 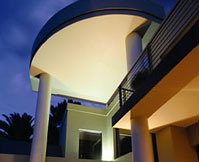 The hotel enjoys quick and easy high way access to Johannesburg, the Sandton area as well as Pretoria. 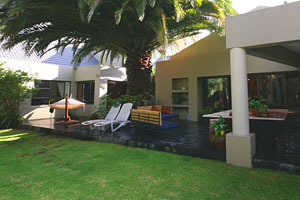 The African Rock is contemporary in design and has a well established and lush tropical garden, combined with a swimming pool and large patio area ensures conference delegates of an efficient but relaxing stay. The conference delegates are offered nine double bedrooms that have a choice of king sized or twin beds. The rooms interiors continue the fusion of African, Western and Oriental design trends creating a warm, welcoming and comfortable atmosphere. 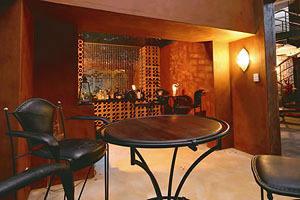 All of the rooms have full en-suite bathrooms with bath and separate shower. The boardroom conference facilities at the African Rock Boutique Hotel in Johannesburg are suitable for up to 20 conference delegates.